The new season is right around the corner and just like in previous years, Real Madrid will be traveling to the United States to prepare for the challenges ahead. 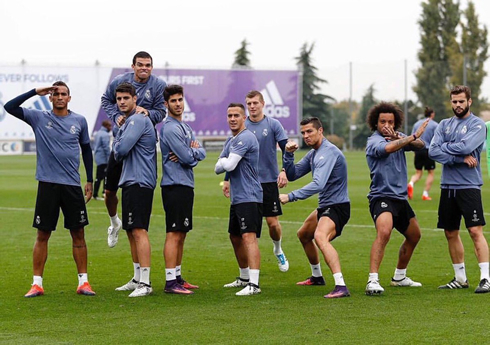 The Merengues will play friendlies in Santa Clara, Los Angeles, Miami and Chicago. Real Madrid will initiate their pre-season agenda for 2017-2018 in just a few days from now. On July 10, every Real Madrid player except Cristiano Ronaldo and the Spanish U21 national team players will meet in Valdebebas, Madrid, in order to go through the typical medical tests. On the day after, on July 11, the team flies over to the United States to kickoff with the pre-season training and get prepared to play 4 friendlies with Manchester United (July 23), Manchester City (July 26), Barcelona (July 29) and the MLS All-Stars (August 2). Cristiano Ronaldo, who has been given a few extra days of vacation because of his participation with the Portuguese National Team in Russia at the FIFA Confederations Cup, should join the team in American soil already, just a few days before the first test against the Red Devils. The 2017 US tour will be one of the toughest pre-season Real Madrid has ever been through. The back-to-back European champions didn't exactly pick easy opponents and from day 1, they'll be tested to the limit. Just 12 days after landing in the United States, on July 23, Real Madrid will go head to head with José Mourinho's Manchester United. The last time the two teams met was precisely 3 years ago in a friendly in North America, with the Red Devils leaving the field victorious with a 3-1 win. This year however, this matchup will work as a warm-up for the UEFA Super Cup final, which will be played on August 8, in Macedonia. This match will mark Real Madrid's debut in the 2017 International Champions Cup, and it will played at the Levi's Stadium, in Santa Clara, California. Home of the San Francisco 49ers in the NFL, the stadium can host up to 68500 fans. Three days later, the 12-time European champions will fly over to Los Angeles, where they'll be facing Pep Guardiola's Manchester City. In their previous 4 meetings since 2012, these teams have tied twice and Real Madrid won the other two. This year's friendly will be held at the Los Angeles Memorial Coliseum, home of the NFL's Los Angeles Rams. The stadium's capacity goes up to 93000 seats. The most anticipated game in this year's pre-season will definitely be the one going down on July 29, in Miami. It's El Clasico, Real Madrid vs Barcelona and it's going to be played in the United States for the first time in History. 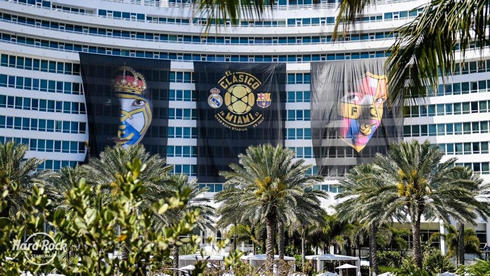 The clash will take place at the Hard Rock Stadium to a live audience of 65326 spectators, in another pre-season friendly that can be looked at as a warm-up game for what's coming next. Real Madrid and Barcelona will meet again twice in August 13 and August 16, for the Spanish Super Cup 2-legged final. This will also be the first El Clasico outside Spain in the last 25 years. The last game of Real Madrid's US pre-season tour this year will be against an all-star team from the MLS (Major Soccer League) and it will be played on August 2. The stage for this friendly will be the Soldier Field in Chicago, home of the NFL's Chicago Bears. This stadium can host up to 61500 fans and just like in all other games in their US tour, we can expect it to be at its full capacity. Real Madrid should then travel back to Spain the day after (August 3), as they'll have their first official match against Manchester United for the UEFA Super Cup on August 8, in Macedonia. A few days later, on August 13, Real Madrid plays Barcelona for the 1st leg of the Spanish Super Cup and then, on August 16, they play again Barça for the 2nd leg. The European champions' debut in La Liga should finally take place on August 19, on a Sunday. Cristiano Ronaldo next game is a friendly game for the International Champions Cup on July 23 of 2017 against Manchester United. You can watch Juventus live stream, Real Madrid vs Man United, Juventus vs Barcelona, Tranmere Rovers vs Liverpool, Sydney FC vs Arsenal, and Bayern Munich vs Hoffenheim, all matches provided from our soccer live game pages.